Genting Singapore, a subsidiary of major Malaysian gaming and hospitality operator Genting Group, said last week that the Casino Regulatory Authority of Singapore has renewed its casino license for the operation of the Resorts World Sentosa integrated resort. Genting Singapore further pointed out in a statement that its license has been extended for another three years with effect from February 6. 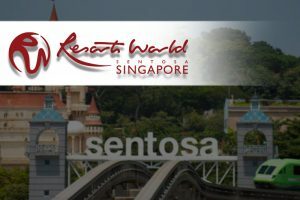 The company operates the Singapore-based hotel and casino resort through its wholly owned subsidiary Resorts World at Sentosa Pte Ltd. subsidiary. Resorts World Sentosa opened doors on the island of Sentosa, located off Singapore’s southern coast, in February 2010. The property is one of two integrated resorts with dedicated casino gambling space that were authorized by the government of the city-state back in the 2000s, the other one being Marina Bay Sands. Singapore officials moved to lift a four-decade ban on gambling and legalize casinos within larger integrated resorts in a bid to revive the island-nation’s slackening tourism industry. Although lawmakers authorized the construction of just two integrated resorts with Las Vegas-style casinos, Singapore quickly cemented itself as one of the world’s top three gambling hubs, with Macau and Las Vegas being the other two. In addition, the city-state’s legal casino framework eventually turned into the gold standard by which Japan crafted its own casino regulations. The global casino field is preparing for what could be the biggest-ever licensing race. Japan legalized casino gambling just over two years ago and is now gearing up preparations to start the bidding process for three licenses for the operation of gaming facilities at three integrated resorts. A number of major gaming and hospitality operators have expressed interest in Japan’s nascent casino market that is expected to top $10 billion once its first gambling venues open doors, and Genting Singapore has been one of them. In a report released last summer, research firm Maybank Kim Eng said that the Singapore subsidiary of Genting Group has one significant advantage over most of the companies that will be bidding for a Japanese casino license. Maybank analysts pointed out that with its “huge net cash pile”, Genting Singapore might be in a better position to fund a large-scale integrated resort project than its debt-laden American rivals that are eyeing entry in Japan. According to a January monthly chart by the Singapore Exchange, Genting Singapore was among the best performing tourism-related stocks last month. The company saw its return hit nearly 11% in January on the back of consistent growth in international arrivals to Singapore. The city-state saw 16 million international visitors during the first 11 months of 2018, up 6.6% year-on-year. The post Genting’s Singapore Resort Gets Three-Year Casino License Extension appeared first on Casino News Daily. Encore Boston Harbor, the $2.6-billion integrated resort currently under development in Greater Boston, is on track to open doors on June 23, Wynn Resorts CEO Matt Maddox told investors last week. Wynn Resorts and MGM Resorts International were picked in the early 2010s as the preferred developers of Massachusetts’ first integrated resorts with commercial Las Vegas-style casino operations. MGM debuted its $950-million MGM Springfield last August, while Wynn Resorts aims to cut the ribbon of its property in mid-2019. However, the Massachusetts Gaming Commission is yet to rule on whether the Las Vegas gaming and hospitality powerhouse is suitable to operate an integrated resort in the state. The Wall Street Journal released last January a comprehensive report detailing multiple sexual harassment allegations against Wynn Resorts founder Steve Wynn. The casino mogul found himself embroiled in a massive public scandal and quickly resigned from his CEO and Chairman posts in the company, vacated his Wynn Las Vegas villa, and sold his stock. The Massachusetts Gaming Commission opened an investigation into the allegations and to what extent Wynn Resorts was involved in the scandal shortly after the publication of the WSJ article. Gaming regulators in Nevada and Macau, where Wynn Resorts operates integrated resorts properties, also commenced separate probes in the allegations leveled against the businessman. With its investigation, the Massachusetts Gaming Commission aimed to discover whether high-level staff at Wynn Resorts had any knowledge of the alleged multiple incidents of Mr. Wynn using his power to subject female employees of the company to unwanted sexual advances and sexually harassing them. The Massachusetts gambling regulator also investigated Wynn Resorts’ suitability to enter the state’s nascent casino market. The probe was originally expected to be completed in August, but commission investigators asked for more time to review the issue more thoroughly. The regulatory body then targeted December publication of its finding, but Mr. Wynn sued in Nevada the regulator and Wynn Resorts in November, saying that the company he had found communicated pieces of information to the Commission that violated attorney-client privilege. A Nevada judge has temporarily blocked the publication of MassGaming’s report and her final ruling is expected to come shortly. Mr. Maddox has shown great optimism that Wynn Resorts will be allowed to open and operate its resort. The company recently settled with the Nevada Gaming Control Board. It was ordered to pay a fine, the size of which is yet to be determined and to get rid of the employees who were aware of Mr. Wynn’s doings but did not act properly. Mr. Maddox told investors last week that the company has already pushed out those staff members. Wynn Resorts executives now hope that the Massachusetts Gaming Commission will be able to wrap up its probe by mid-March and many of them seem to believe that there will be a positive outcome. The post Wynn Resorts On Track to Open Massachusetts Casino Resort in Mid-2019, CEO Says appeared first on Casino News Daily.